This room can be a bit difficult to locate. The star on the below map shows the location of the door to use. Pizza and refreshments are served at 6:45p.m. With the presentation starting at 7p.m. Exact meeting locations are posted to the mailing list, usually with at least three week's advance notice. Our meetings currently average around 75 people in attendance. The next option is to park in the underground garage. 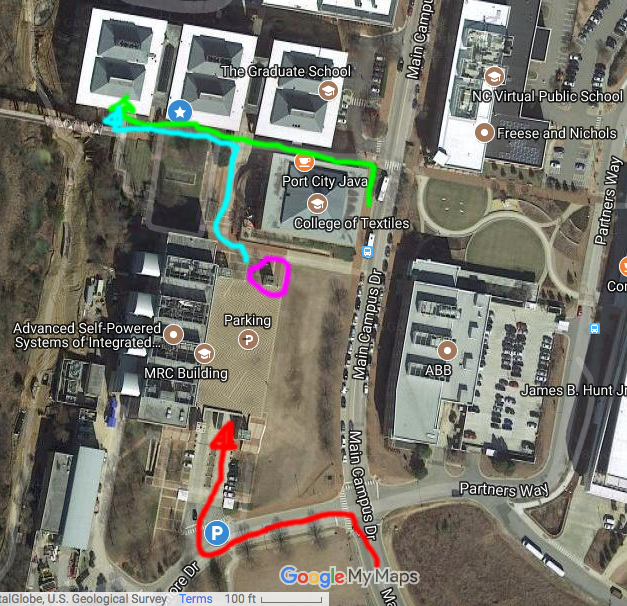 If you are coming from I40, you will follow the red arrow to the garage (left at campus shore drive and then take the first right); if you come from the other side, you would make a right at campus shore drive. Once in the parking garage you take the stairs up to the purple circle. From there, take the blue route to the last of the 3 similarly-looking buildings (at least from the picture).